Aigner No.1 Oud is ideal for leather clothing and accessories made of leather. Aigner No.1 Oud 100ml. Eau De Parfum is a traditional fragrant work that will attract you with its warmth and spiciness. Fragrance inspired by eastern countries, where appropriate quality also comes in conjunction with the modern world. The impressive and elegant composition, whose character you love. 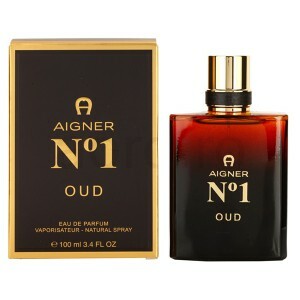 Aigner No.1 Oud Parfum is unisex, which can benefit both men and women. Neutral tones in the form of coriander, cloves or cinnamon take care of it. Become familiar with the dust haze around his body, which will become completely private. Give in luxury and nested spices. Dark red vial of scented water unisex Aigner No.1 Oud was combined with gold cap. Powerful rendition, which calls for applying to the body. Whether you're about anywhere, indulge in a spicy freshness needed and impress olfactory senses of everyone around you. Luxury East, its mysteries and enduring charm inspire people of different spheres of activity. Not spared them and perfume art. Known house Etienne Aigner tried to embody the uniqueness of the East in the new creation - perfumed water Aigner No.1 Oud, and without a doubt they have succeeded! Bottle strict form, contains the quintessence of the beautiful land of fairy tales, spices and luxury. Rich bouquet spoils the sense of smell with the variety and harmony of each component at the same time. The first thing you hear, getting acquainted with the aroma - it spices. Coriander, cinnamon, nutmeg filled with magic song. They prepare you for the coming of intoxicating jasmine, velvety roses, delicate violets with hints of clove. It feels the passion that goes into tenderness, luxury and pleasure. Flex creates fragrance of cashmere wood, unique beats and pungent saffron. Perfume Aigner No.1 Oud - a symbol of elegance and unhurried life, that belongs to men when they are surrounded by luxury. The composition radiates like a treasure. No wonder the light motif in each note there is a smell of expensive leather.